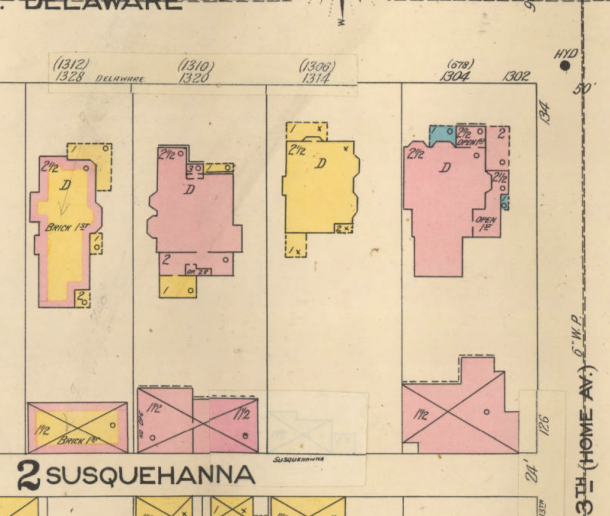 It’s hard to imagine today, but Delaware Street just north of downtown, was not always the one-way superhighway it is today, flanked on both sides by large apartment buildings, commercial operations and a smattering of remaining mansions. There was a time when it was pretty much all mansions, all the time, through what is today the Old Northside. 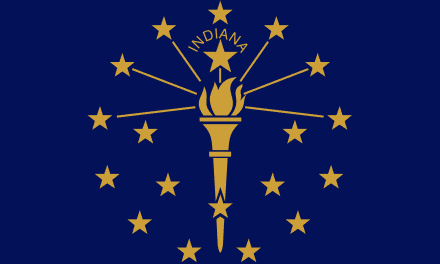 In addition to the home of a U. S. president, multiple lawyers, and one of the most beloved mayors of Indianapolis, were many entrepreneurs and titans of local industry. The L. S. Ayres family lived just south of President Harrison, and the H. P. Wasson family, just south of them. That entire block served as part of the Arthur Jordan College of Music in later years, but that is another story to be found here. A couple other entrepreneurial families of note close by on Delaware Street included brewing barons John W. Schmidt and then Joseph C. Schaf in the sprawling property now owned by The Propylaeum; Hervey Bates, Jr., a wholesale grocer and son of the founder of the Bates House Hotel on the northwest corner of Washington and Illinois streets; and Charles F. Smith, founder and president of the Indiana Bicycle Company. Along with the homes of the afore-mentioned Ayres, Wasson, and Bates, the Smith home is among the ghost homes of the Old Northside. Those homes, while no longer standing, live on through their photographs and the properties where they stood, now otherwise engaged. It is often painful to see what stands on a parcel of land in the current day versus what once stood in its stead. The Smith home is no exception there. 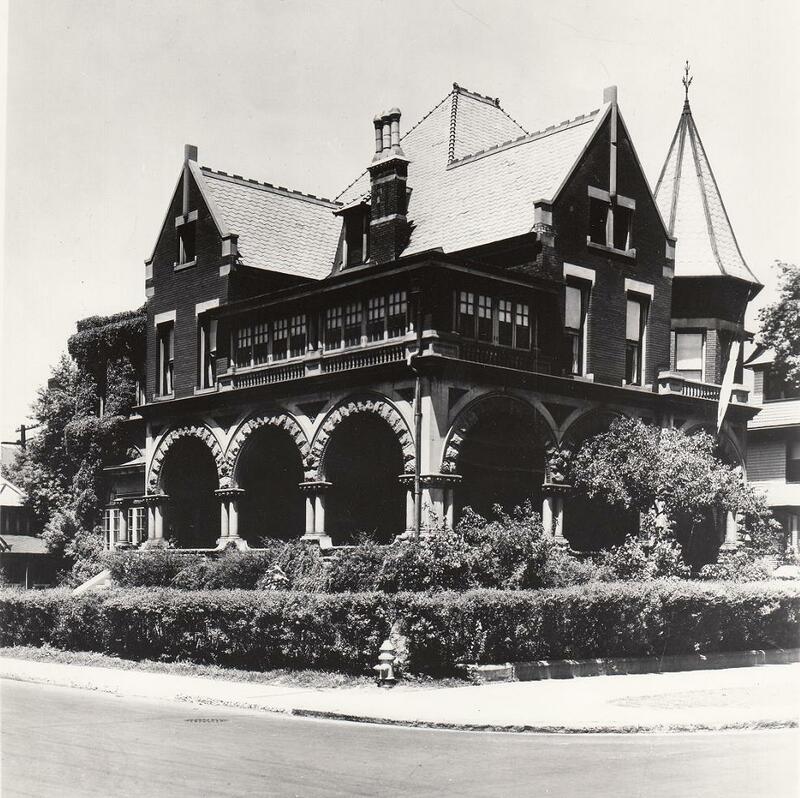 Much like the former Hervey Bates, Jr. home on the northeast corner of 13th and Delaware, the home on the northwest corner of the same intersection is also one that captivates the imagination and prompts vivid dreams of the formal era in which it was built. Its earliest address, 678 North Delaware, does not appear in the city directory until 1880, after George W. Stout, a local wholesale grocer, took up residence there with his family. 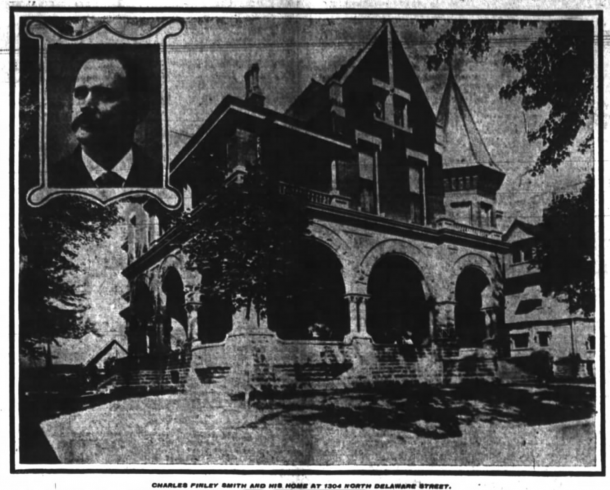 An article in the fall of 1880 noting a small fire at the house also mentions that this is a “new residence.” Two years later, Stout moved over to Meridian Street and Dr. William P. Johnson, took up residence in the home; Johnson was a longtime partner of Horace Allen, at the Surgical Institute, who, coincidentally, lived across the street at 1305 North Delaware Street. Dr. Johnson died in October 1889 at his Delaware Street home. In January 1891, Johnson’s daughter married Joseph K. Sharpe, Jr. in the same location. The newlyweds and a few other family members appear to have stayed here until selling the property in 1893 to Charles F. Smith. It wasn’t much later that Sharpe and his wife moved into the house next door, where they stayed through her death in 1911 and his in 1920. Smith and family took possession of the home on November 1, 1893. Not long after, Mr. Smith started expanding the house and introducing his own special touches. In the fall of 1894, Smith filed permits to add an enlarged porch, to build an addition to his stable and to add a brick kitchen. 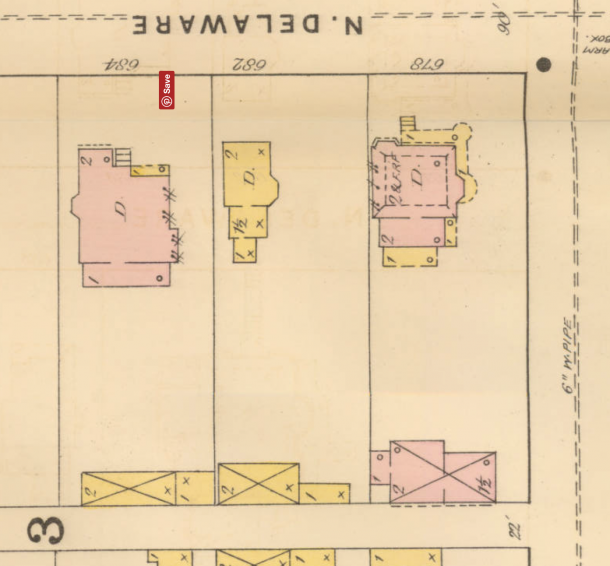 This accounts for the expanded footprint between the 1887 and 1898 Sanborn maps above. Additionally, the house was eventually lit by its own electric light plant and had a tunnel connecting the house and the detached stables. Smith also installed a bowling alley in this subterranean connector between the stables and main house. The majestic corner home was cited in more than one newspaper article as having “one of the finest” dining rooms in the city, with a chandelier modeled after one in the Waldorf-Astoria hotel. 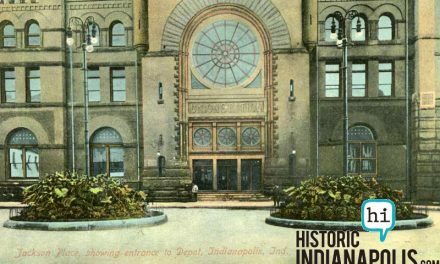 This was quite a grand home, and certainly a far cry from Smith’s first home in Indianapolis–a 6-room cottage, not far away, in what is today Herron-Morton Place, at 1715 North Alabama, which still stands today. The Smith family lived there just under ten full years, selling the home to John W. Schmidt for $35,000 cash, elegantly furnished, in June 1903. Schmidt, who lived at 1410 North Delaware (The Propylaeum, today) had just sold his home to George F. McCulloch for $85,000. Schmidt took possession on July 15 and, like Smith before him, began a number of alterations to the house. The house frontage was 74.5 feet on Delaware Street and a substantial 205 feet on 13th Street, and the Schmidt family stayed there a little more than ten years total. The patriarch of the family died at the home in February 1914. Just a couple of years later, the home was again sold, to the Lynn B. Millikan family. 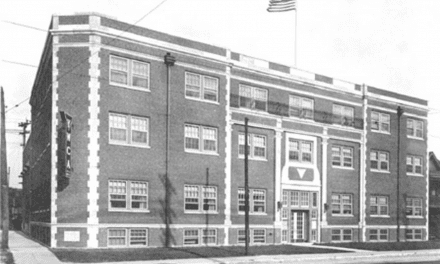 Millikan was a local contractor, very active in the goings on of the real estate world, building, buying and selling numerous properties. In April 1935, the board of zoning appeals were petitioned by Millikan, who desired to use the residence for the sale and sample display of funeral equipment. Neighbors protested the commercial reuse of the beautiful mansion, and so it went through a series of varying uses, before and after the mortuary idea. 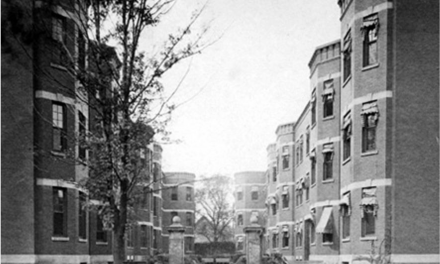 In 1932 became a girls dorm room for the Normal College, at the Athenaeum. A “Hocus Pocus” club was briefly stationed at that address and it looks like a few varying rentals were made of the space until 1950. 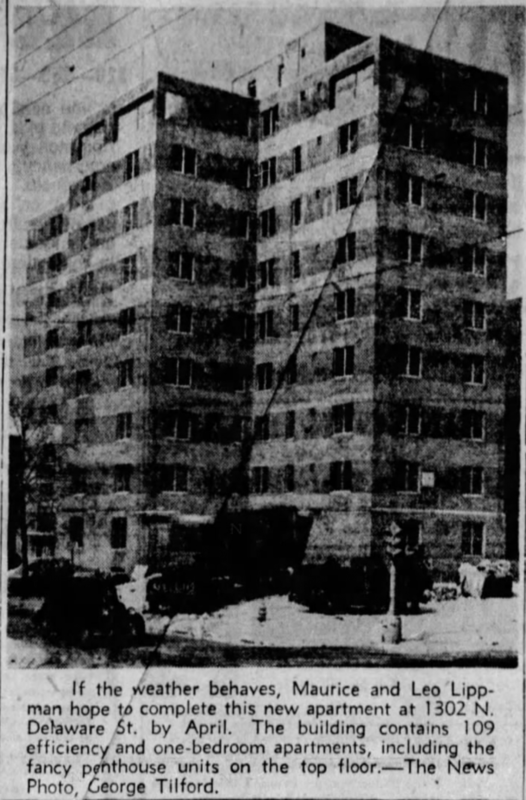 The nine-story Sherwood apartment building with 109 units–30% one-bedroom flats and the balance, efficiency units–would rise atop where this majestic abode once stood. Not only was this home destroyed, but also, the house next door, where the Sharpe’s had moved after selling this property. 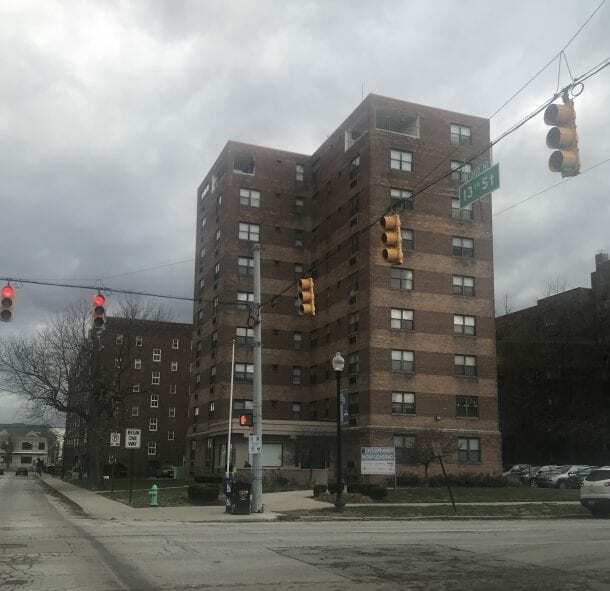 The Lippman Brothers, who were building three apartment building within Indianapolis at the same time, estimated that the building would be ready for occupancy by the end of 1950. 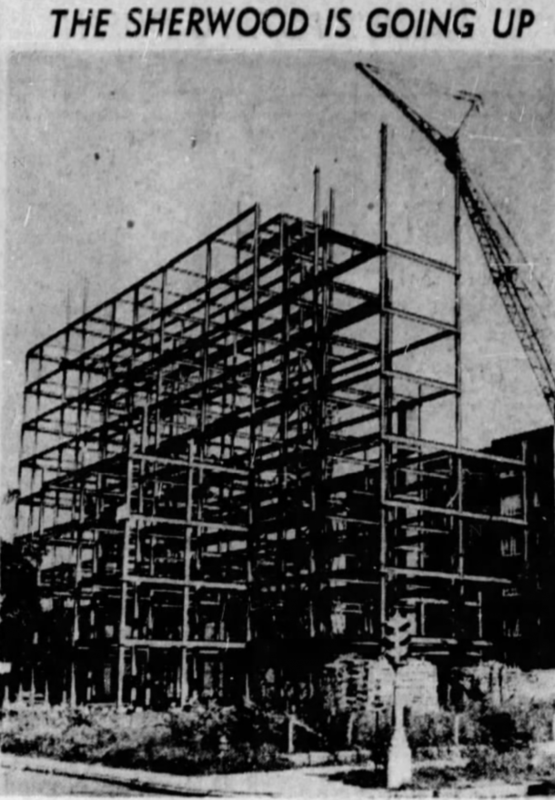 However, Mother Nature had other plans, delaying the construction schedule, and in April 1951, reports said that two or three of the floors would be ready for tenants by May 1. 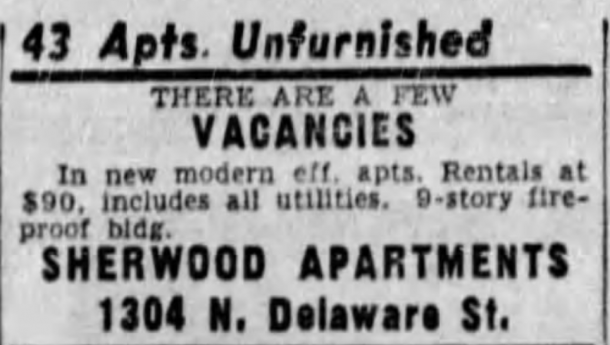 By June 1951, the building was actively seeking new tenants with ads like the one below. 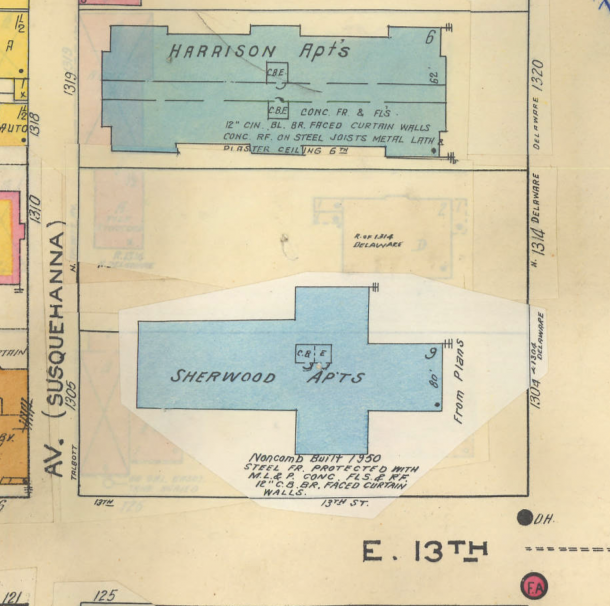 This Sanborn, amended after 1950 (though mysteriously dated 1948) shows how the footprint of the Sherwood Apartments consumed the two previous lots. You can see the ghost outlines of some of the prior buildings under the pasted version. And so it continues to this day. Still standing in 2018, the Sherwood Apartments, on the northwest corner of Delaware and 13th Streets will never be as beautiful as the mansion that once stood on this corner. Phyllis Wheatley Y. W. C. A. Great photos! Something new to think about as I’m driving up Delaware.